Pat 'the SausageMan' Sansonetti is a tireless worker who loves Australia and Rotary more than we can describe in words. You'll have to meet him to get the full story! Why not stop by Pat's famous Sausage Sizzle and say G'day to this man who is dedicated to making the world a better place for others. 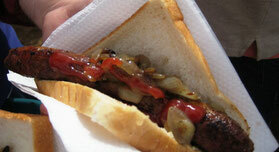 Pat unashamedly reckons he cooks the 'best sausages in town', so all we can say is: "You be the judge". You'll find Pat outside Safeway in Rosebud and we thank all those who support this important fundraising project carried out by this one man on a mission. Pat is also a great supporter for our Rotary club by marking out the sites for the Rye Foreshore Market which we run on the first Saturday of each month.